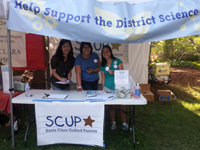 Santa Clara Unified Parents (SCUP) is a network of school site council members, PTO/PTA members, community leaders and concerned parents of students within the Santa Clara Unified School District (SCUSD). As a parent organization we strive to support all parents and students within our community. We hope this forum will encourage parents to communicate with each other about our schools, the enrichment programs, and the successes and concerns on all the campuses within the Santa Clara Unified School District.